Classic Boat Truck Bed Lid! Idea of the day. 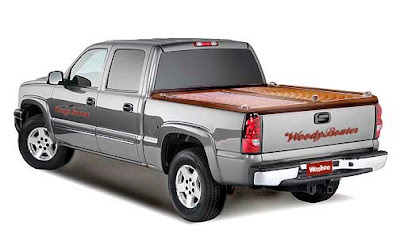 Take that hard covered truck bed lid and add some woody boatness. It’s simple really. It can all be done with vinyl.www.phoenixgraphix.com has the wood grain for mini vans and such, you can get it by the roll and it just goes on with water. I was thinking getting two shades, so the covering boards are darker. Add some pin striping, boat cleats and you are crus’n. Do the hard cover in nice plywood and Mahogany trim. Then you can practice your finish work. Hopefully you do it after your boat is done.